You'll be £12.99 closer to your next £10.00 credit when you purchase England's Witchcraft Trials. What's this? Thou shalt not suffer a witch to live. With the echo of that chilling injunction hundreds were accused and tried for witchcraft across England throughout the 16th and 17th centuries. With fear and suspicion rife, neighbour could turn against neighbour, friend against friend, with women, men and children alike caught up in the deadly fervour that swept through both village and town. From the feared “covens” of Pendle Forest to the victims of the unswerving fanaticism of The Witch Finder General, so-called witches were suspected, accused, and dragged into the spotlight to await judgement and their final fate. 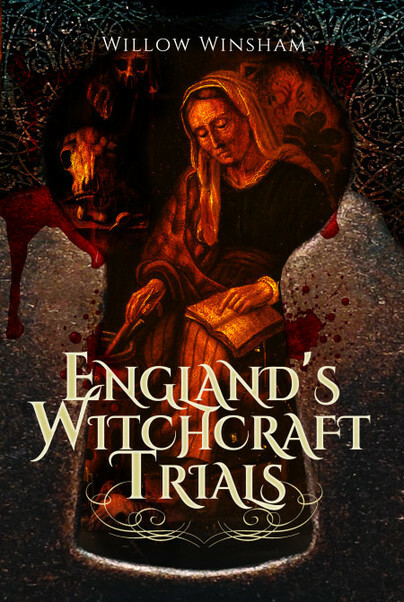 An excellent book on England’s witch trials, written by an author with a genuine passion and empathy for her subject. For instance, Winsham writes a brilliant piece on the case of The Pendle Witches in 1612. Really good introduction to witchcraft trials in England. The author focuses on several of the more well-known trials (including Pendle) as well as looking at two of the best-known witchfinders. Highly recommend if you want to learn more about the subject, but don't know where to start! Witches and how they were treated in the middle ages have always been a fascinating subject not just gor me but for anyone interested in the social history of England. Willow’s books fills in a huge number of blanks and reminds us of the obsessive behaviour towards them that was prevalent at the time. I found it to be an excellent read, giving a solid introduction in to witchcraft and witch trials in England, and I'd highly recommend it as a good place for the curious reader to start. It is detailed and well-referenced, but lucidly written and an entertaining as well as an illuminating read, which sets to right many assumptions and misconceptions about witchcraft in English history... this is highly recommended not just for students of witchcraft, but for anyone interested in the social history of the sixteenth and seventeenth centuries, especially its darker side! When a book is as interesting, informative and insightful as this, it's natural to be left wanting more, but frustrating to know more is only slightly out of reach. This is a book that rewards reading, with an extensive bibliography and notes for those interested in more details. I certainly recommend it to those with spurious ideas about witchcraft and the history of persecutions in England. Willow Winsham brings readers regular tales of witches and witchcraft at her blog, The Witch, the Weird and the Wonderful. Combining a passion for research and history with a love of storytelling, she dedicates her time to investigating some of the most intriguing stories from the history of the British Isles. When she isn't digging out tantalising historical titbits or tracing elusive family members, she is busy writing historical fiction and home educating her two children.